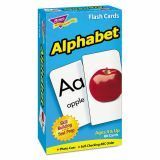 TREND Skill Drill Flash Cards, 3 x 6, Alphabet - Alphabet Skill Drill Flash Cards easily teach the alphabet with self-checking photo cues for letter sounds. Flash cards are fun skill-building activities for home, school and travel. Set contains 80 cards. Ideal for prekindergarten to first-grade (ages 4 to 7).